You have spent hours decorating your tree, putting up the lights and wrapping the presents in preparation for a magical Christmas. You have carefully chosen all the chocolates and treats and you have prepared an amazing dinner. Your Christmas deserves the most spectacular dinner table to wow your guests and keep them entertained but how do you do it? Here are the top tips for the most captivating dinner table ever! Many dining areas are quite small which can result in cramped conditions around your Christmas table, especially if it has been extended. Consider moving the table to a larger space like a living room or hallway to give your guests room to circulate. Try not to seat too many people at one table or they will spend all afternoon bumping elbows as they try to eat. Decide on your seating plan in advance thinking carefully about who to seat where. If there people who do not get on keep them apart, separate children who may squabble and put yourself somewhere where you can easily get up and move about. Use decorative place cards to ensure everyone sits where you intended. Choose a theme for your table and build your design around it. This could simply be the color scheme or something more elaborate like Christmas traditions, the nativity or perhaps something aimed at the children who always love Santa and his reindeer. Try to find a theme that fits with items you already have, you probably don’t want the expense of buying everything you are using from scratch at what is already a costly time of year. Take inspiration from the napkins, plates and candles you already have and then just buy some extras to bring it all to life. Every great table deserves a center piece for an eye catching display! It does not have to be something costly and extravagant so check out what you already have before buying something new. A nice vase with flowers to match your color scheme, a display of holly and greenery from the garden or a mini Christmas tree, get creative and seek out something that complements your theme. No need to rush out for a new dinner service! Use the one you have but buy some inexpensive acrylic chargers for the place settings and you can use them year after year. Spruce up your wine glasses with charms and tie ribbons around your napkins and your table is coming to life. It is a lovely touch to place a small gift for each guest at their place setting. The gift tag could also serve as a place card. Wrap each gift to match your theme or use favor boxes filled with sweets and small surprises. You could even put a lottery ticket in each of your boxes to give everyone a bit of excitement over the festive period. You might consider making your own crackers and including a small gift in those or draping Christmas stockings over the chairs. The gifts will brighten the day for your guests and create talking points to keep everybody occupied. Complete your table with creative and decorative touches to add color and sparkle. 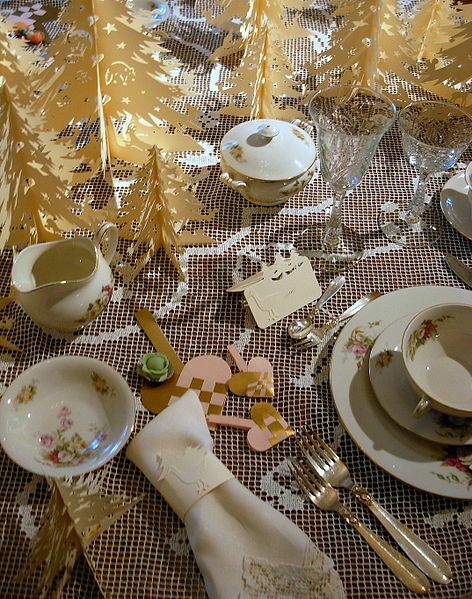 There is some fabulous festive party ware out there to choose from. Whatever your theme you should be able to source some small items to bring it to life. Have a look at table confetti, party poppers, napkin rings and candles and consider including some entertainment. The Christmas meal should be savored and the party spirit in full flow so put out some miniature games, magic tricks or quiz cards to keep everyone talking and cheerful. Create a table to remember with color, charm, gifts and entertainment and all of your family and friends will marvel at your brilliant planning and imagination! The kids will be happy, the family won’t argue and you can sit back and enjoy your achievement. Sally S writes on a wide range of subjects and is at the moment dusting off the Christmas partyware and raiding the holly bushes in preparation for Christmas!